Mumbai Indian vs Kolkata Knight Riders Live Streaming IPL 2017 Score MI vs KKR: Mumbai Indians (MI) had a tough time competing Rising Pune Supergiants (RPS) in the introductory game of Indian Premier League (IPL) 2017. In IPL Match 7th, MI will face KKR on Sunday. In contrast to MI, KKR won their opening game against Gujrat Lions by 10 wickets. Gautam Gambhir and Chris Lynn maintained a healthy partnership till the end and managed to chase the humungous score of 183 runs, having 5 more overs left to play. In fact, the partnership established a record opening history in IPL. Taking about Mumbai Indians, they underperformed in their opening match and ended up losing to RPS by seven wickets. Steve Smith (RPS Captain), 84 not-out, had a blast during the match. 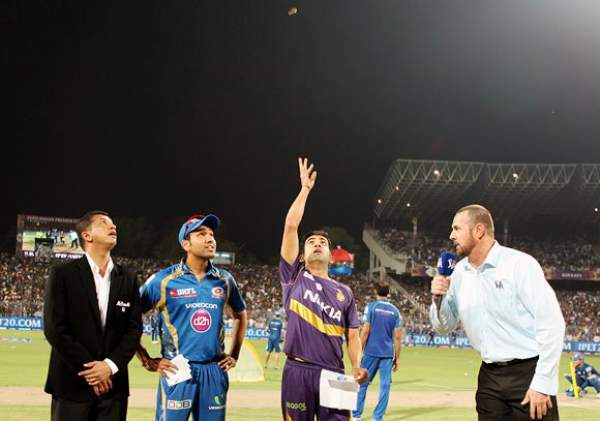 However, history tells us that out of 18 matches MI played with KKR, they have won 13 times as compared to 5 wins of KKR. MI faced defeat due to bad bowling line-up, bowlers were struggling to grab wickets and opponents took the advantage by scoring runs. This problem is now solved as Lasith Malinga will be joining the team back again who is currently the highest wicket-taker (143 wickets) in the IPL history. Mumbai’s coach Mahela Jayawardene has decided to call Harbhajan Sigh for this crucial match, who earlier didn’t play as per coach’s commands. Another player Asela Gunaratne also joined the team recently but he is kept out of the squad as of now. MI batsmen did not perform up to par, Jos Buttler had the highest score of 38 while others were hanging between the 20s & 30s. After healing from the injury, Rohit Sharma is looking good and ready to hit some centuries. He better gear up and start hitting those shots early as possible, starting with today’s matchup. Shakib Al Hasan, international allrounder from Bangladesh Cricket Team joined Kolkata and will give a thrilling performance for sure. Umesh Yadav, who is out of the team for unknown reasons, is replaced by another pace bowler Ankit Rajpoot. The IPL 2017 Live Streaming in Sri Lanka, Nepal, Bhutan, and Maldives will be made available through Sony Network. Willow TV & ESPN – People from the USA can watch the broadcast on these channels. Sky Sports for UK audience and Super Sports for South Africa for live cricket streaming. Stay tuned for more sports news and IPL updates round the clock.